Rosemary focaccia bread! 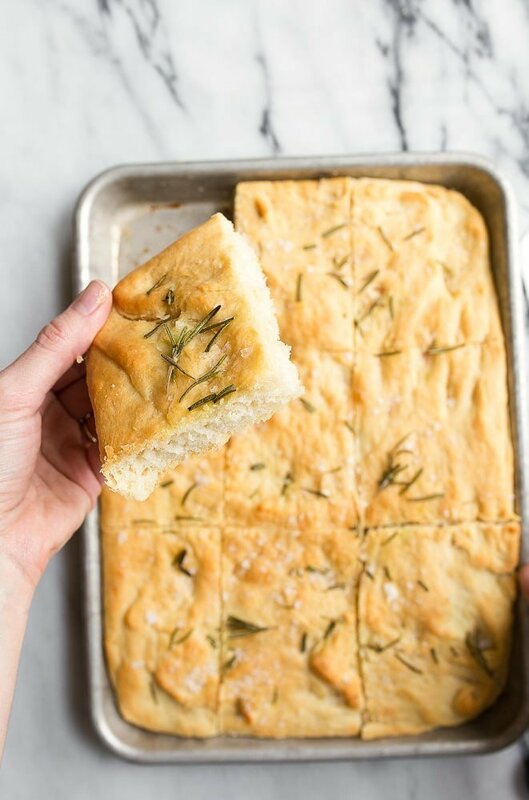 How to make a small batch of focaccia in a quarter sheet pan. Easy focaccia recipe in just 2 hours. Hey! Hi. Hi! I’ve been eating a lot of bread. And I think it’s related, but I’m feeling very happy these days. It’s a very good thing. The weather got cold again and so I sat in front of the oven, tore off large pieces of this homemade focaccia, and dunked it in excessive amounts of peppery olive oil. My fingers are greasy, but my belly is full. I love being well-fed. I put a call out on instagram a few weeks ago asking for recipe requests. After scanning the list several times (thank you guys so much), and noticed an overwhelming number of requests for small batch yeast breads. Baking bread is one of my favorite things to do with a spare few hours in the kitchen. Working with yeast brings me joy. (Have you seen my small-batch cinnamon rolls?) It’s magic in the kitchen! I’m so happy to tackle this request for you guys. There are quite a few breads on my list to make, but I wanted to start with something easy. Something quick. Minimal effort, maximum reward. You know how I roll. Rosemary focaccia bread. You’ve had it, right? It’s a rich dough made with olive oil and covered with herbs, and it’s typically not more than 1″ high. It’s thicker than a flat bread, but not suitable for making a true bread loaf. After 5 failed recipe attempts, I’ve decided that the reason focaccia doesn’t rise very high is due to the copious amounts of olive oil. I also decided that the reason focaccia is so delicious is due to the copious amounts of olive oil. Rosemary focaccia bread is the BEST sandwich bread, if you ask me. It’s light and fluffy, and very easy to bite through. I love eating it simply dunked in olive oil, but I also love to make a salami, brown mustard, marinated artichoke and pickled carrot sandwich with it (I’m not high maintenance, I swear). Some people compare focaccia to pizza dough, but this is a comparison I don’t understand. Pizza dough is thin and chewy; focaccia is soft and fluffy. If your pizza dough is fluffy, I don’t think you’re making pizza dough correctly. But that’s just me. I think the comparison is referring to the Italian roots of both doughs. 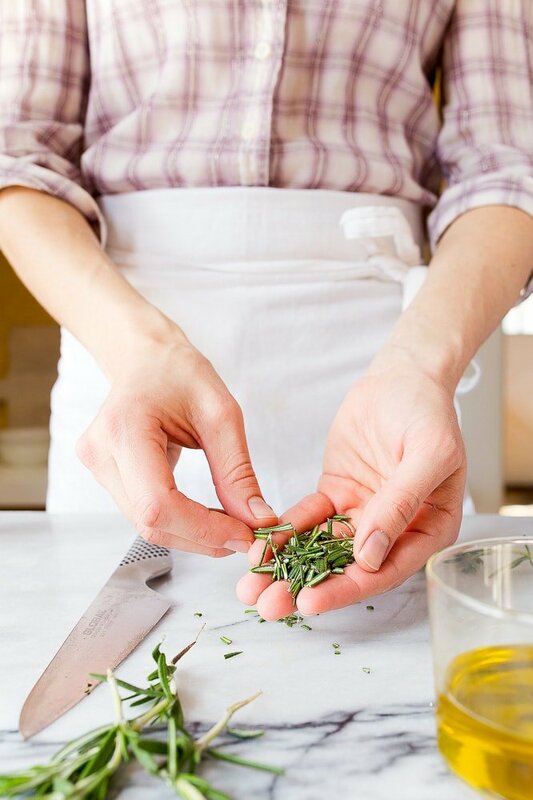 Rosemary is traditional on top of focaccia dough, and I have a heavy hand with it. I used the older, woodier tips of my rosemary plants, and I mention that because if you use young, tender rosemary leaves, it has a tendency to stain your dough green. No big deal, really, but I don’t like explaining to dinner guests why I’m serving green bread. I already have to explain so many things, like why my child eats all of the food on her plate and then begs for yours too. And how is it possible that a child of her size puts away so much sauerkraut. Oh, and did I notice my baby has quite a large belly and is looking rather chunky today? Yes yes, and that’s just how I like my babes. We’ve strayed off course. Rosemary focaccia bread made in a quarter sheet pan (<–link to the one I use) for a smaller serving size. That’s what you’re here for today, correct? A quarter sheet pan sounds super fancy. It’s not. It’s basically half of a normal-sized sheet pan. If you don’t have one, you can absolutely make this bread with a regular sheet pan, but know that it will spread a bit more. Keep an eye on the edges while it bakes. Olive oil. Be generous and loving with it. Pour it in the dough, pour it liberally on the pan, and then lovingly brush it again when it comes out of the oven. It’s the key here. Please make sure your yeast is fresh and alive. Wait a full 15 minutes to make sure it blooms in the warm water. If its alive, it will be very noticeably foamy. The most common failure with yeast bread is using water that is too hot, which kills the yeast. Don’t be a murderer. Use slightly warm, not hot, water. I call for 1/2 cup of olive oil, which is 8 tablespoons total. 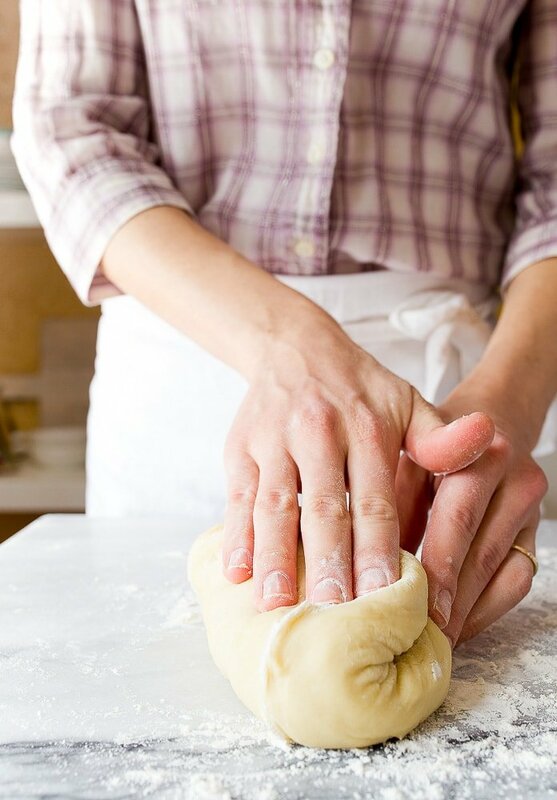 You’ll use 1/4 cup in the actual dough, and then divide the remaining 1/4 cup (4 tablespoons) between the pan and the top of the dough before baking. Easy, right? I love you, and can’t wait until our next yeast bread adventure! 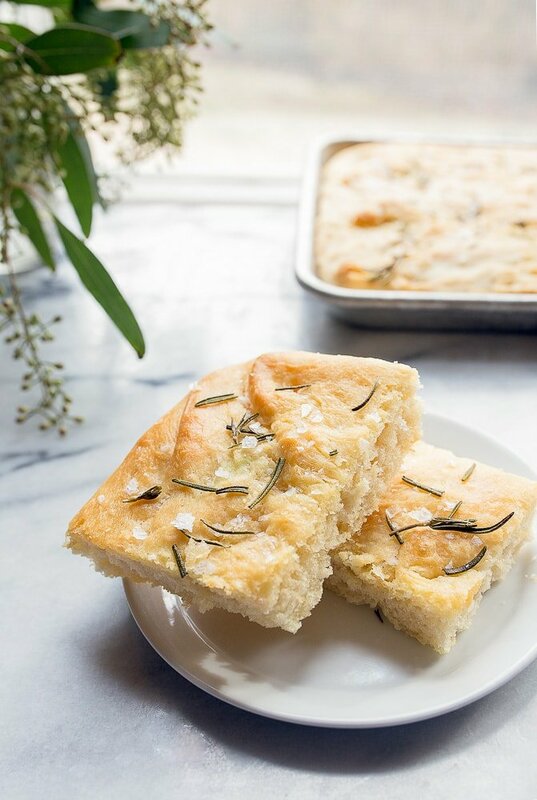 Homemade focaccia bread with rosemary--small batch bread recipe. Place the warm water in a small bowl, and sprinkle the yeast and sugar on top. Stir to dissolve, and let sit for 15 minutes. At the end of 15 minutes, it should be very foamy and noticeably alive. It may even bubble as you stare at it! Meanwhile, in the bowl of a mini stand mixer*, add the flour, salt, and half of the olive oil (1/4 cup). Fit the dough hook attachment into the mixer, and turn it on briefly to mix the ingredients together. Pour the foamy yeast water into the flour mixture. Turn the mixer to medium and knead for 5 minutes. Stop and scrape the dough down every minute or so. At the end of 5 minutes, the dough may be slightly sticky, but that's fine. Flour a surface, and knead the dough for about 30 seconds--the stickiness will completely disappear. Grease a small bowl, and place the dough inside. Let rest in a warm place until it doubles in size, about an hour in my cold, drafty house by the oven. Pour two tablespoons of the remaining olive oil on a quarter sheet pan (measures 9 x 13 x 1"), and spread it evenly. Add the dough to the pan, and use your fingers to spread it to the corners of the pan. Try not to make too many holes, but some are okay. Brush the final 2 tablespoons of olive oil on top of the dough, and place in a warm place to rise again until doubles, about 1 hour again. Sprinkle the rosemary on top of the dough, and sprinkle additional salt (coarse is fun here) on top. Bake the bread for 18-21 minutes, until it starts to turn a light golden brown. Immediately after baking, flip the bread onto a cooling rack (do not let it cool in the pan). Let it cool completely before slicing and serving. 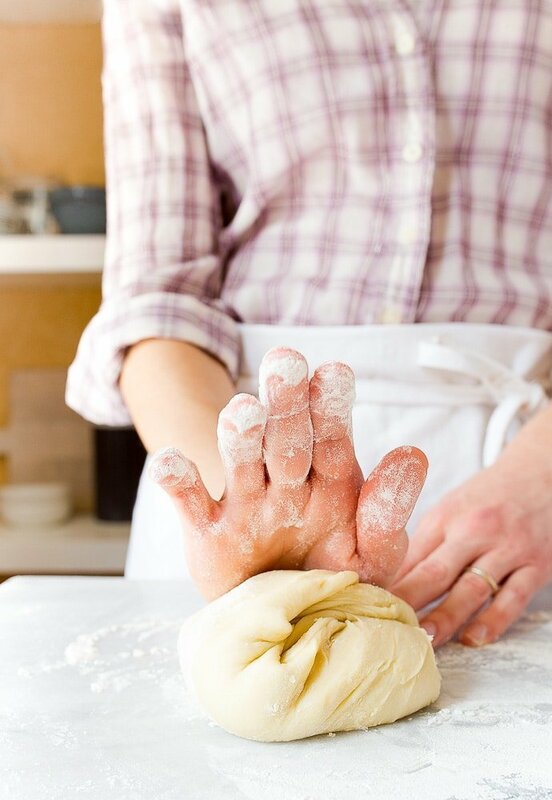 *To make this without a stand mixer, knead by hand for 10 minutes. I love this yeast breads for 2 idea! I have my great grandmother’s recipe for homemade white bread that my family makes every Christmas. It makes 10-15 loaves depending on the weather and I’ve been telling myself for years that I need to scale it down to a more a manageable size so I can make it more often. Would you consider posting your bulk white bread recipe? I made bread with my grandmother and wish I had paid closer attention now. “Don’t be a murderer” hahahaha! This looks great! I was thinking grilled cheese sandwiches and tomato soup for dinner one night this week, but now I’m thinking rosemary focaccia and roasted red pepper bisque. Can’t wait to try this. Looks delicious. In case no one had suggested it previously, I’d love a small batch of soda bread/rolls. Thanks for all your great work! Just wanted to share my mother’s tried and true method for getting water that was always the right temp for yeast breads (at least in our combined substantial experience) – Dip your finger in the water and let a drip fall onto the inside of your wrist. If it’s the right temperature, you shouldn’t feel it at all. It shouldn’t feel cold or burning hot. Basically the method you would use to test babies’ milk in the bottle. Using this method has always given me the perfect lukewarm water that allows my yeast to bloom wonderfully. 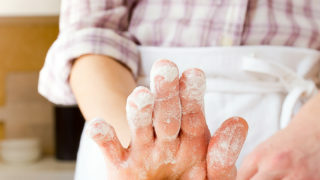 Of course, by now, I can get the feel of the temp by just holding a finger under the running faucet, but I’ve made a fair amount of bread in my day, lol. I still find myself using my wrist from time to time. It’s never failed me. Can the dough sit in the fridge for 24 hours? That is make it tonight an bake it tomorrow night. Yes, put it in the fridge for the first rise in the bowl. You’ll still have to let it double in bulk in the pan before baking, which will take longer since the dough is cold. Work great. Make the dough Monday night going up to step six. Then baked the bread Tuesday night and served it with some spaghetti. Will be making it again. I see you say mini stand mixer. Can you use a regular stand mixer or is there not enough volume of ingredients? Christina, is your “mini” a 3.5qt mixer? I have a 4.5qt bowl. It is! The mini has a 3.5 quart bowl. I used my regular size stand mixer and it worked just fine. I used my KitchenAid and my dough turned out good. Funny that you were talking about focaccia and pizza because I’ve actually used my focaccia bread recipe as pizza dough. It comes out just like it should texture-wise, but it does make the pizza much more filling. :) I’m not sure a mini-loaf would last very long here since we put away a full one in two days, but I like the idea of smaller loaves! It would be nice for gift-giving. I love your recipes. It’s just DD and I and she is very picky. Many recipes are too large and food just goes to waste! This bread will not go to waste!! I love using my rosemary. It is very hard and lives through the mild winters here in North Carolina! Can’t wait to give this a try. I use to make bread for school lunches and loved the smell of fresh bread baking & I think the whole school loved it too! Thank you for sharing. Thank you! Thank you! Small batch bread! And hamburger buns next? Is that bread I smell or a new cookbook? Please? Please? Thanks for the recipe! How about dough for a personal pizza or a pizza for two. Hey i tried this. It was really good . Looking forward to more of ur breads. A good brioche recipe from u would be sooooo good too. Ps trying your chocolate tiramisu on weekend . Yes! Thank you for creating this recipes. I’m making this today for lunch!! Cannot wait to try this! Question regarding the stand mixer- will a larger bowl work? Or is the batch too small for the larger bowl? Or perhaps the knead cycle on a bread machine? Will that work? I made this with dinner last night and it was DELICIOUS! It was very easy. The only thing I did differently was chop my rosemary into small pieces before putting it on top. Thanks for the great recipe! I made this Saturday night and it worked beautifully!!! I might also mention this was my first successful attempt with active yeast!!! Thanks for the great recipe!!! My only downside with the bread as most of my rosemary fell off the bread so the next time I make it might add it to the olive oil on the second rise or maybe even mix some into the dough. Otherwise, perfect portion and oh so tasty!!! Hi Christina, thanks so much for this recipe, the focaccia was perfect!! So soft and fluffy :) I topped it with caramelised onions and olives and I’m definitely making it again! Try adding crumbled Gorgonzola cheese along with the olives and onions. I have made this recipe as written, then again with the caramelized onion and olives. The thirs was with all three! Loved all three variations. I would like to try this recipe. However, the pale grey type is nearly unreadable. Why do blog posters use this pale color???????????? Not to mention tiny type – at least I can up the font size. I like your recipes – if only I could see them….. Yes, Sylvia, it can be frozen! Wrap it tightly! How much flour…in grams, please?! This is INSANELY delicious and makes the perfect size batch for two- I love your recipes!!!! Oh my gosh!! I made bread!! I have always been so intimidated by yeast (I have no idea why!). Well today I decided to go for it & give this recipe a try, & I am so glad that I did! This was so simple, & so delicious!!! Made a rosemary oil on the side to dip it in & I am in heavennn! Thank you for this recipe! Indeed this recipie is great! My first time to bake a bread with yeast and it turned out good. I’m proud with my first focaccia. My husband and son loved it! I’m motivated to bake again. Im so happy to have seen this website! This was the first bread I made with my toddler and she had a blast pushing the dough around the pan and jabbing her fingers in it 😊 Total bonus that it was delicious as well. Would love to see a small batch bread recipe that could be turned into teddy bears that she and I could make together too. Thanks! Great recipe. I am a bread baker and am very aware how difficult it is to pare down recipes. This bread turned out perfect, don’t change a thing. I have a regular sized 5 quart Kitchen Aid Artisan Stand mixer with a dough hook attachment. Oh how I love this focaccia recipe. I’ve also had success reducing the flour to 2 cups and subbing white wheat for half of it. It also makes a great panini with pesto, spinach, mozzarella, and sliced chicken breast. Oh my gosh this focaccia bread is amazzzzzing! I made it for supper tonight alongside some sausage & kale pasta but tbh, I ate 2 pieces of the bread and hardly touched my pasta :) it’s very filling but so so so good. The only issue I had was that I flipped the bread onto a cooling rack from the pan, and most of my rosemary fell off lol so I think next time I would slide it off so it isn’t upside-down. Also for anyone curious, it works great in a regular sized stand mixer and the flour in grams is 340!